SolarFlare Games is looking to create a new miniatures skirmish game. It's called Dawn of the Archmage. Players take the roll of said Archmages and will compete against one-another to show the dominance of their particular school of magic as well as their command of various fierce beasts. The game will be headed to Kickstarter on the 1st of next month. SolarFlare has posted up a Kickstarter preview for you to check out. Dawn of the Archmage is small unit (miniatures) skirmish game for 2 to 4 players, ages 8+. 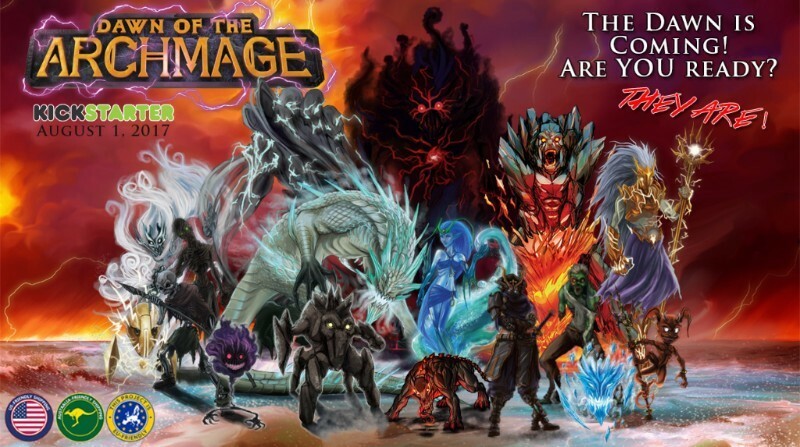 Each mage will represent a school of magic, summoning powerful monsters to the battlefield. Pitting their fearsome creatures in pitched battle, one mage will reign victorious, ascending to the title of Archmage. Do you have the strength and strategy to defeat your enemies? Will you become the Archmage?